This old house of ours doesn’t have a ton of storage the way a modern home does. 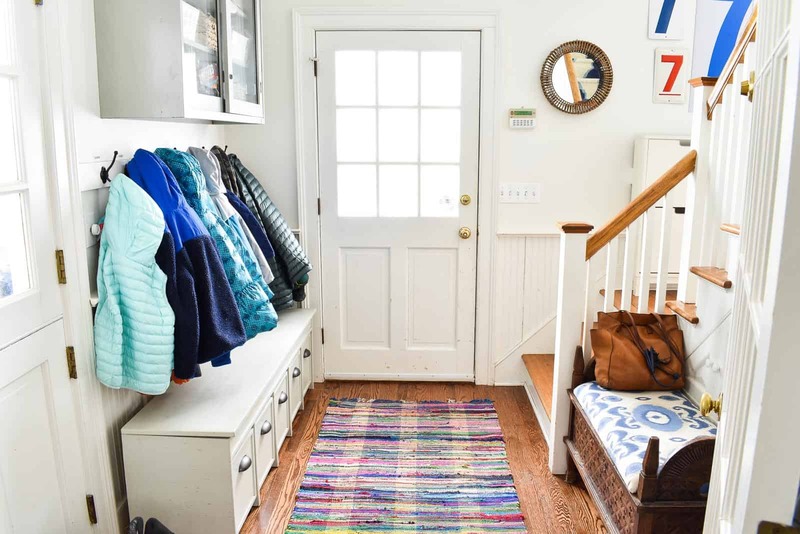 No built-in cubbies, no walk-in front hall closet… nada. We have a small little area inside the back door and *this* is our drop zone for everything. Five kids’ backpacks, boots and more boots, coats, hats, gloves, roller blades, dog leashes, and on and on. 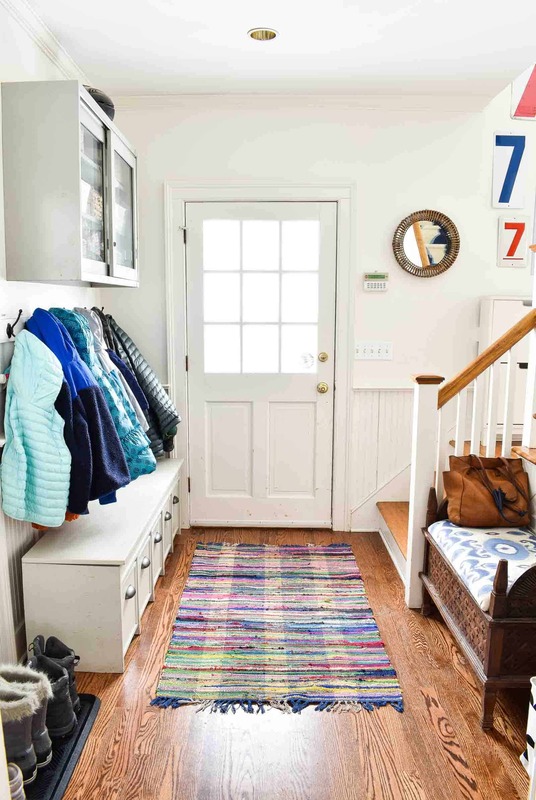 Early on, I converted this space into more of a mudroom. I added a row of hooks to hold allllll the coats. And I grabbed that old lab cabinet at a salvage spot to help with smaller items like sunblock, diaper bags, bug spray… See my post about that here. Also… reminder that THIS was how the room looked when we moved in. The storage bench was DIY and it’s perfect for our gang. 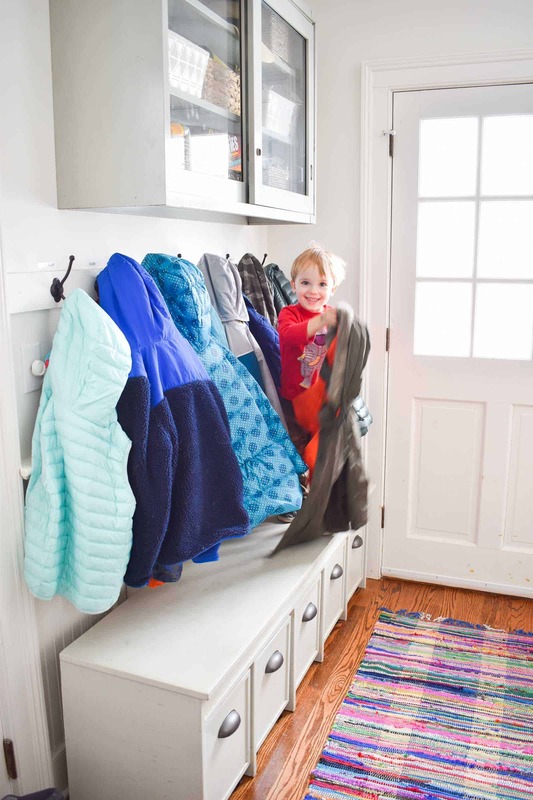 Everyone has a drawer for shoes and it’s also helpful for the smaller kids to help reach their coat hook. The drawers are on casters and they slide in and out really easily. 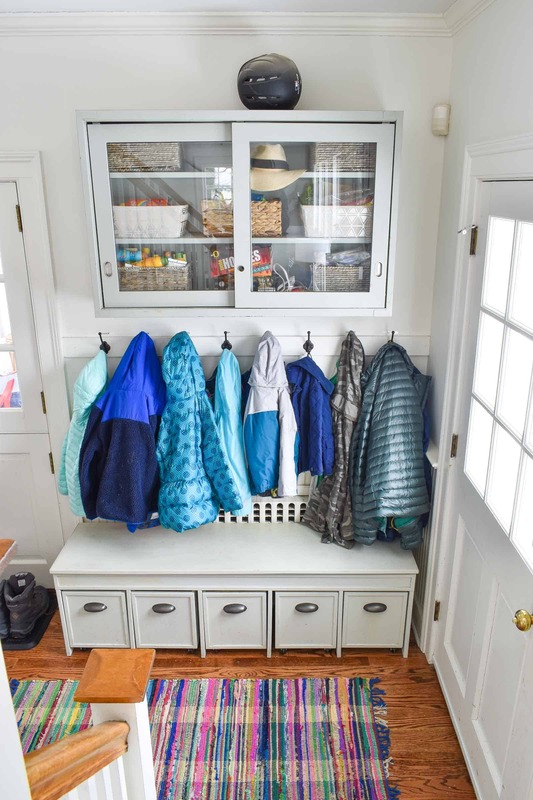 Most of the time, this mudroom works great. But… there’s something about the winter that stretches the organizational limits of this space. 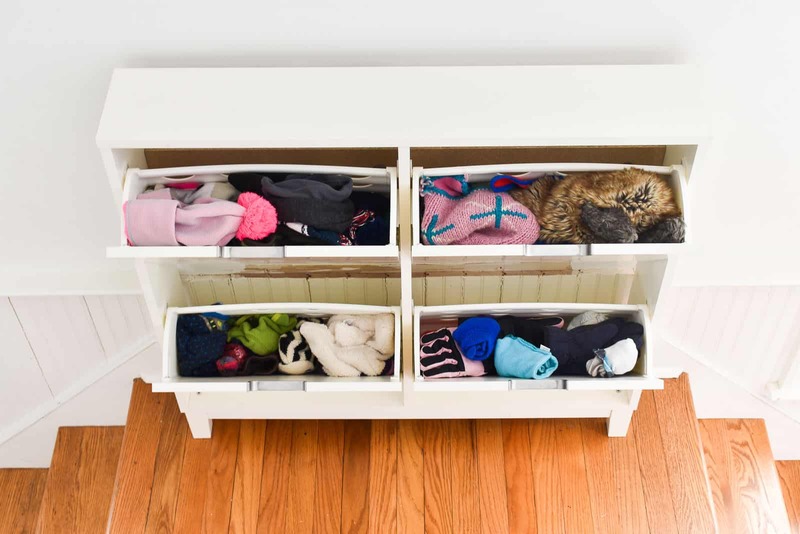 I felt like we had boots and hats and gloves just LITTERING the house, so I came up with a couple of systems and wanted to share them with you! These were making me crazy so I made this fun boot ‘tree’. It’s essentially a ladder with dowels to hold the boots and I love it. 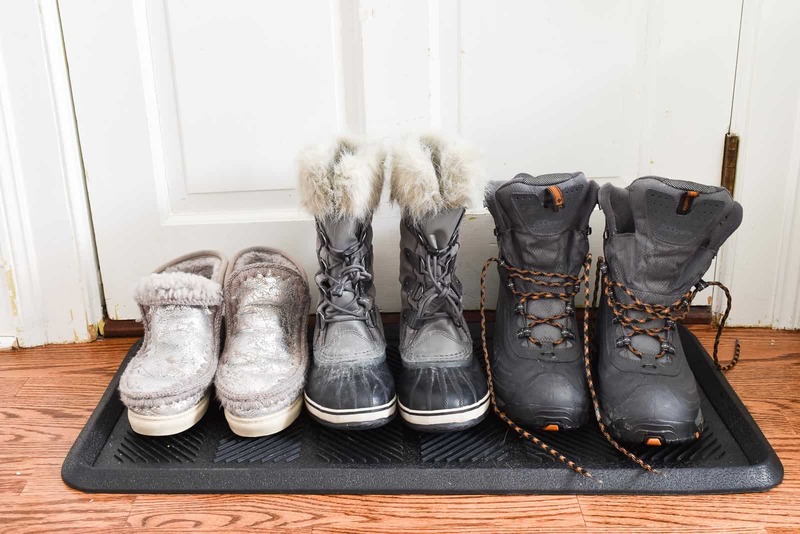 I also have a flexible rubber tray (affiliate) to hold larger boots OR wet/ snowy boots. 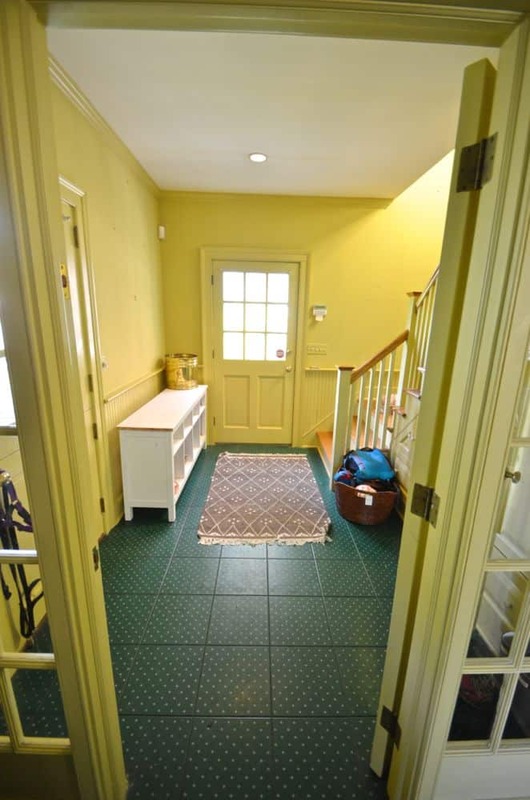 The porch door can still open over it, so it’s a nice thing to have on hand during the snowy months. This rig is technically for shoes, but I liked it because it was narrow. 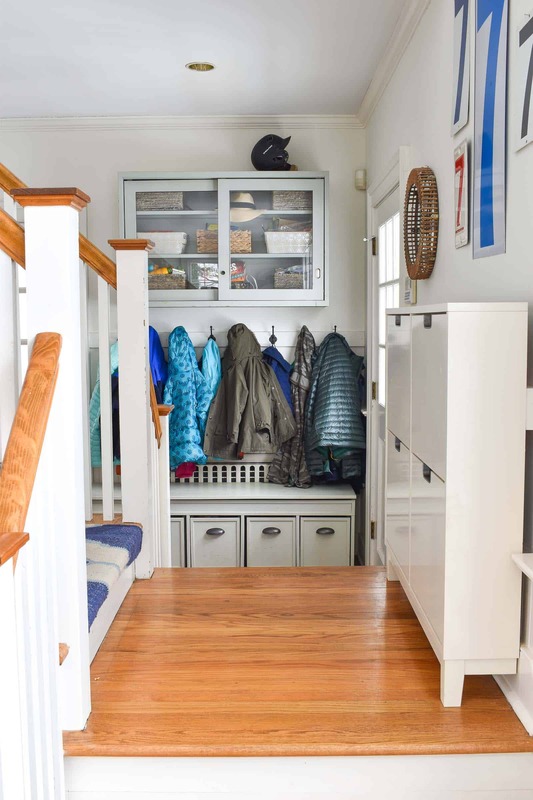 I had to remove our chunky chair rail so it would sit flush against the wall, but it’s perfect for all the hats and gloves the kids use and it doesn’t take up a ton of space at the foot of the stairs. 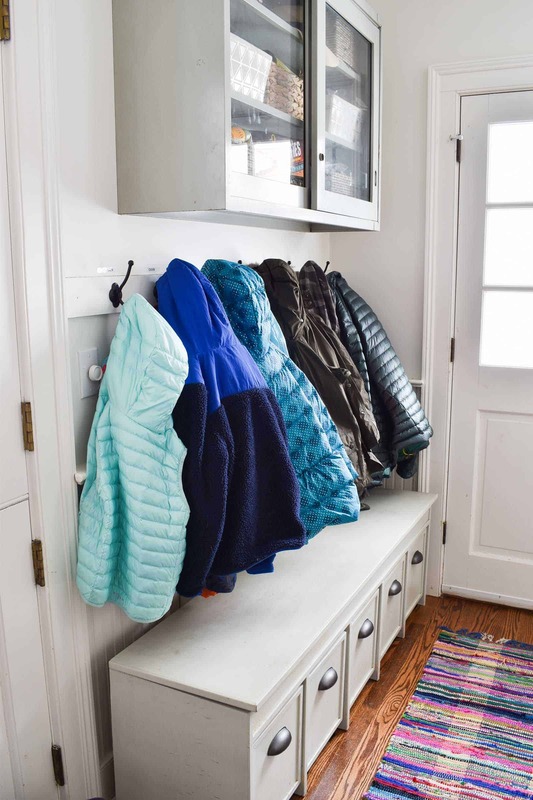 I mean, obviously we have the hooks, but I love that these ones have 2 places to hang our coats per hook. 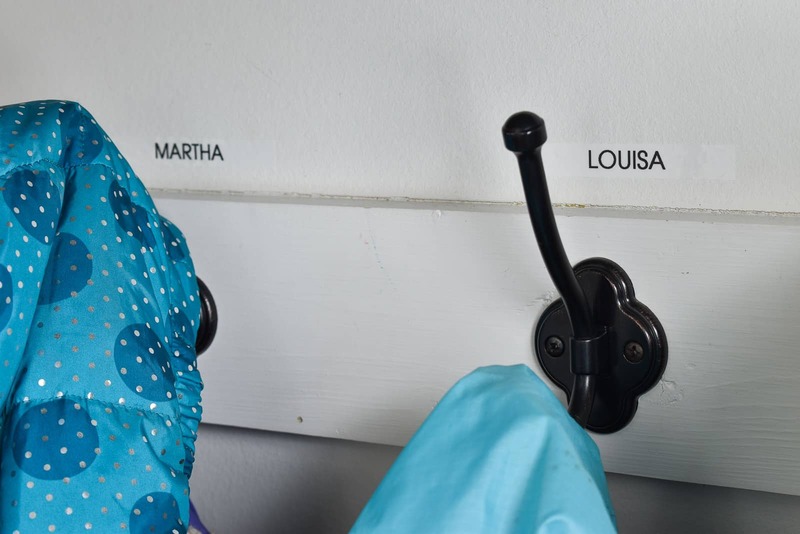 I added some labels so the kids would remember which hook belongs to them. Also, I love labeling just about anything. 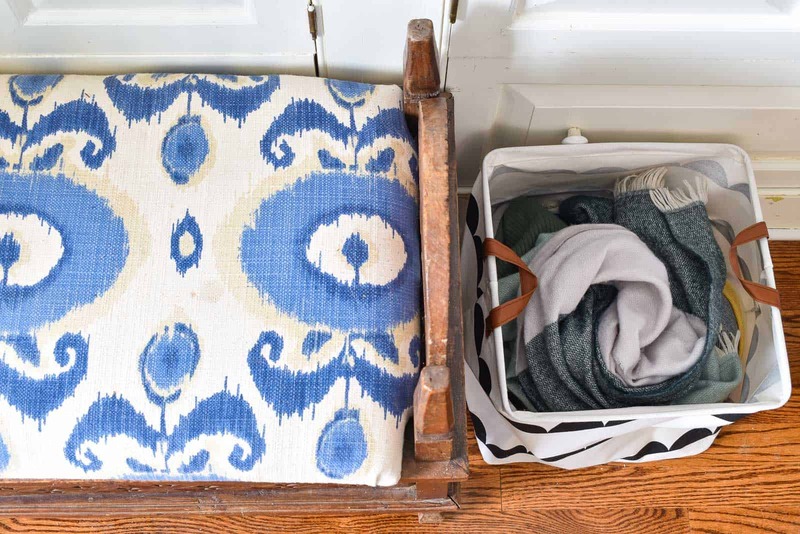 Scarves were tricky too because they would always get buried or fall off the hooks, so I just went ahead and picked up this lightweight canvas bin (affiliate) for us to toss neck warmers and scarves. Last but not least… snowpants. These only come out when there’s snow on the ground, but they live inside the bench when not in use! I keep gloves without a mate in a small bin inside the cabinet and then toss any mismatched ones at the end of the winter. 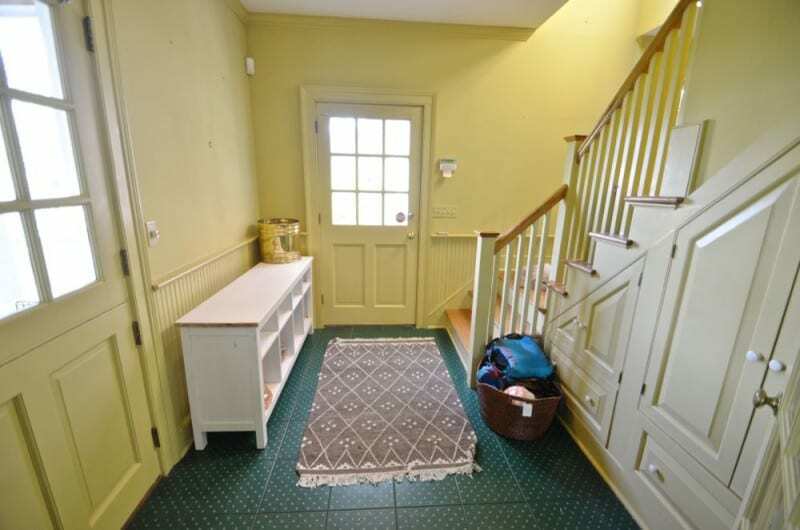 There’s often a towel draped over the newel post of the staircase for drying off the floor or the dog. That bench becomes a catch all for purses and backpacks and nailguns that need to go back to the shed… that kind of stuff. 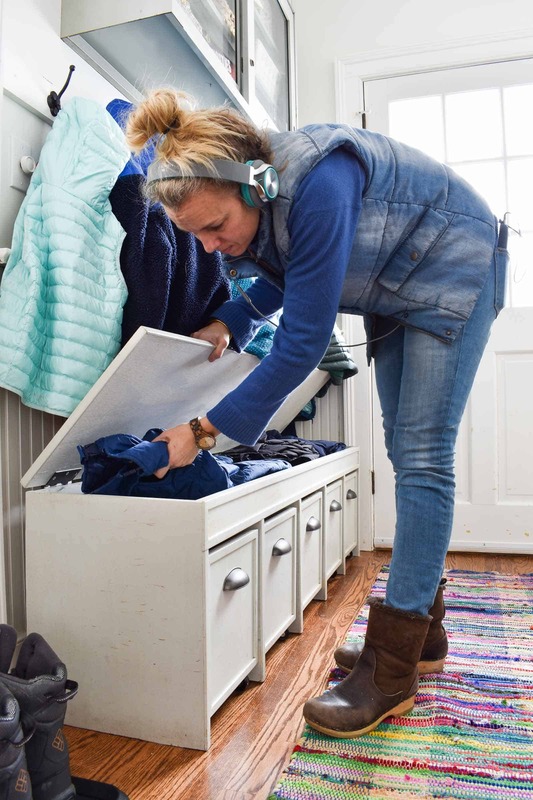 So don’t be thinking this space always looks this clean and tidy… you’re smarter than that, folks. Ha! 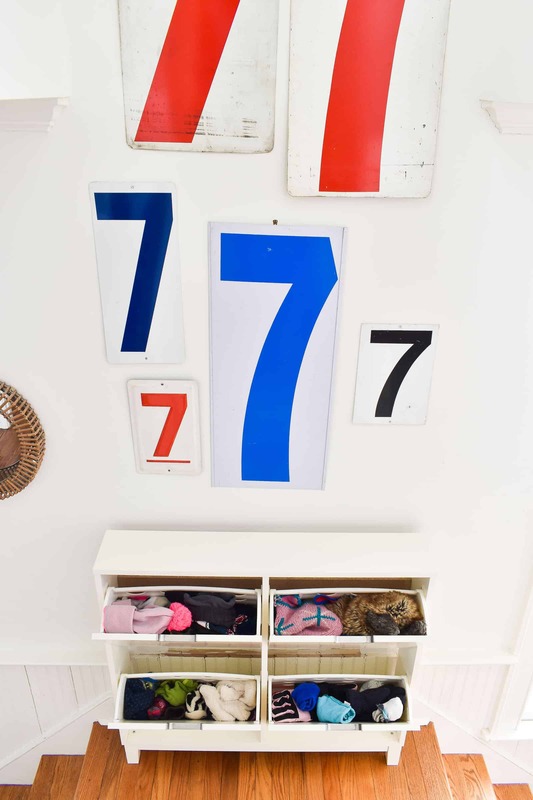 Want to see the mudroom side by side? It’s come a LONG way!!! How do you all organize everything this time of year? Any other tips or tricks? PLEASE SHARE!! Love it now❣WeRe those CarPet tIle Squares in the bEfore pic? Thanks! I’m not sure which carpet squares you mean? Sorry! I think those were the actual tiled floors and not carpet tiles. 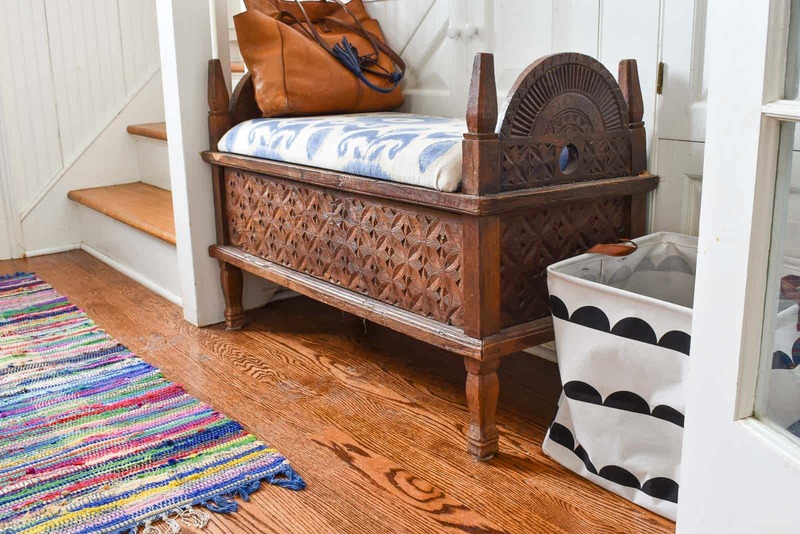 Can you share the plan you used for your DIY BENCH AND DRAWERS?